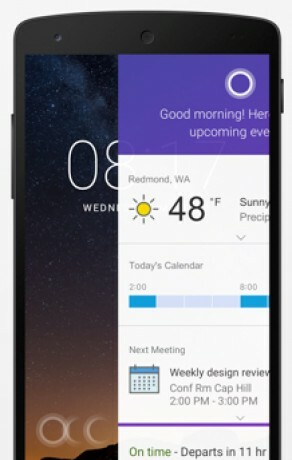 Microsoft today made it possible for Android device owners to access and use Cortana above the lock screen on their smartphones. Microsoft has been testing the feature since earlier this year and is now rolling it out to all users. People can swipe on the lock screen to see Cortana's basic information screen as well as ask Cortana questions, set reminders, and view their calendar appointments. These features are all usable without requiring people to unlock their devices. Microsoft also improved Cortana home on Android, which now includes more glanceable information about daily schedules, commute times, reminders, as well as shortcuts to creating reminders and calendar items. Last, Microsoft is making Cortana available to Android and iOS devices in Australia. The new version of Cortana with lock screen access for Android is free to download from the Google Play Store. Microsoft today dropped a rebuilt version of Cortana for iOS devices. Cortana is similar to Siri in that it can perform actions based on voice requests. Microsoft and Amazon today announced a new partnership that will allow Windows 10 users to access Alexa via Cortana, and Echo users to access Cortana via Alexa. The tie-up lets people use one personal assistant to open the other.